You are buying one NICE CLUMP of Palm Grass (Setaria Palmifolia). Each clump actually has 5-7 individual plants in it that you can either divide or plant together as a clump. The long leaves will be trimmed back for shipping down to about 10 tall. These will grow back quickly once the plant is re-established in its new home. Palm grass (Setaria palmifolia) is an evergreen tropical grass with wide, accordion pleated leaves that are 1-3 feet long and 2-5 inches wide that resemble the foliage of young palms. In frost free climates a clump of palm grass can get 4-6 feet tall and easily as wide. It is extremely easy to grow, thriving in everything from sun to shade, damp to fairly dry soil and even does well in containers. Palm grass prefers moist soils and can be planted at the edge of lakes and ponds where it will thrive (if not actually take over). Amazingly, palm grass is also happy growing in dry shade and established plants are relatively drought tolerant. Hardy in USDA Zones 8 - 11, this is a tropical grass that dies to the ground when it freezes. If the roots don't freeze, though, it comes back in spring. Palm grass is evergreen in zones 10 and 11 (and in zone 9 if planted under an oak canopy). Propagate palm grass by division and by seed. It will self-seed in warm climates but seedlings are shallow rooted and easy to eliminate. Palm grass is a good choice for growing in tubs or containers (wouldn't this look great around your pool or on your patio to add a wonderful tropical feel?) and can be stored indoors for the winter. Some gardeners in cooler zones grow palm grass in the ground in summer, then dig it up and bring indoors in winter. In warmer climates, palm grass is grown in the partial shade of palm and oak trees, in the woodland garden, and makes a nice border plant along walkways and driveways. 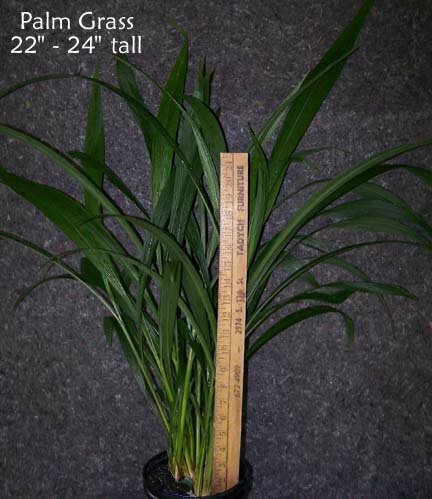 Palm grass can be invasive in zones 9-11, plant with care in these zones.